In Apollo's Legacy, space historian Roger D. Launius explores the many-faceted stories told about the meaning of the Apollo program and how it forever altered American society. The Apollo missions marked the first time human beings left Earth's orbit and visited another world, and thus they loom large in our collective memory. Many have detailed the exciting events of the Apollo program, but Launius offers unique insight into its legacy as seen through multiple perspectives. He surveys a wide range of viewpoints and narratives, both positive and negative, surrounding the program. These include the argument that Apollo epitomizes American technological--and political--progress; technological and scientific advances garnered from the program; critiques from both sides of the political spectrum about the program's expenses; and even conspiracy theories and denials of the program's very existence. 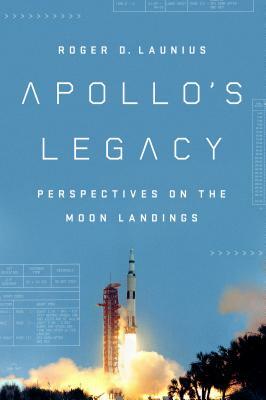 Throughout the book, Launius weaves in stories from important moments in Apollo's history to draw readers into his analysis. Apollo's Legacy is a must-read for space buffs interested in new angles on a beloved cultural moment and those seeking a historic perspective on the Apollo program. ROGER D. LAUNIUS is former associate director of collections and curatorial affairs at the Smithsonian National Air and Space Museum. From 1990 to 2002, he served as chief historian of NASA. He has authored and coauthored numerous books, including The Smithsonian History of Space Exploration. "Space Age aficionados, political junkies, and general readers will find both the unexpected and the fascinating in Launius’s scrupulously researched account." "The book also provides extensive background material on the space program, both from within NASA and from outside observers, as well as a useful annotated bibliography for those who want to do their own research. A valuable summary of an important piece of modern history and its effects and a must-read for space enthusiasts." "Launius' insightful cultural analysis of all that Apollo has signified helps celebrate the first lunar landing's 50th anniversary." "Roger D. Launius’s Apollo’s Legacy is a masterly written and impeccably researched overview of the Cold War space race between the United States and the Soviet Union. Nobody knows NASA history with the insight and exactitude of Launius. Every page brims with fresh insights. Highly recommended!" "An incredibly inspiring and well-researched story of the origins and accomplishments of the Apollo program, Launius’s Apollo’s Legacy is a superb tutorial for all of us who consider ourselves to be strong proponents of human exploration of the Moon and Mars. Replete with previously untold background stories of the battles to gain approval for Apollo and to manage its execution, this book is instructive on the contemporary challenges—political and societal—that we face in trying to maintain momentum for the continued pursuit of human journeys and settlement beyond low Earth orbit." "With the perspective of half a century lived in the afterglow of the Apollo project, historian Launius provides a trenchant three-dimensional analysis, plotting Apollo’s legacy over time against the axes of political left and right, and of legitimate triumph versus hoax-mongering. He brings to life the idealism that in unusual coalition joined innovation and geopolitics, as 'all the cosmic tumblers clicked into place to make possible successful Moon landings.'"